Catalina Island is one of the most beautiful, unspoiled places along the California coast, close to Los Angeles but protected by a nature conservancy. It's a beautiful place to visit with lots of wild spaces, but camping spots are scarce. And because you have to get there by boat, there are some things you need to know about what you can take and how to get it there. Check the Catalina Express baggage requirements before you pack. It's especially important to know that U.S. Coast Guard regulations prohibit carrying camp stoves and lanterns (except electric ones) or any kind of fuel canisters. However, you can rent those when you reach the island through Camping Catalina. If you like the idea of camping but hate the hassle, Camping Catalina can help with that, too. They offer a "comfort camping" service that includes site setup, catered meals, and real beds to sleep in. No pets are allowed at any of the Catalina Island campgrounds. This is especially important to ensure the health of the island's rare and endangered Catalina Island Fox. In fact, the island's entire fox population was nearly wiped out by a rabies epidemic some years ago. Reservations are required at all these campgrounds. It's a good idea to make them as far ahead of time as possible. The Hermit Gulch Campground is located just outside of the main part of Avalon, on Avalon Canyon Road. They have tent campsites and tent cabins. It's within walking distance of town and the only place to camp that's close enough to do that. You can rent sleeping bags, ground pads, tents, propane lanterns and stoves at the campground in case you don't have them or don't want to carry them over on the boat. Tent cabins at Hermit Gulch are a good idea if you'd rather not have to deal with tent setup and sleeping on the ground. You'll still need to. However, if you're trying to save money, this might not be your best option unless you have a large group. A tent cabin and camping fee for two adults will cost more than $100 per night. The campground has coin-operated showers. During a drought when water restrictions are in effect, they are not heated. Black Jack Campground is more inland, with 11 campsites and beautiful views. To get there, you can take the Safari Bus or Airport Shuttle from Avalon to the trailhead, then you can hike about 1.5 miles - or hike 9 miles to get there from Avalon. Two Harbors Visitor Services rents some camping equipment, so you don't have to drag it all over on the ferry. 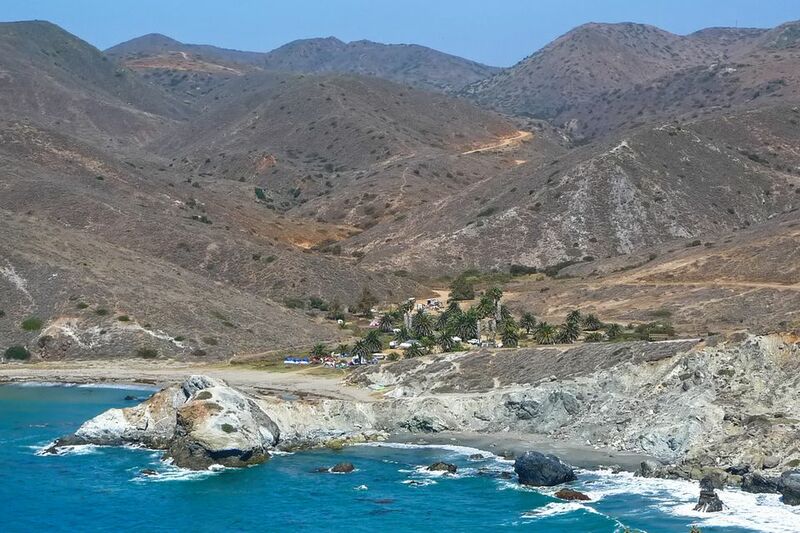 Two Harbors is the tiny community at the northwest end of Catalina Island. It gets its name from the fact that the island narrows and there are harbors on both sides of a narrow isthmus. This location offers tent camping and tent cabins in Two Harbors Campground. You can also choose a small, Catalina Cabin. A couple of group campgrounds are also available. A few boat-in only campsites are available, but no moorings are available and you have to bring your own water and port-a-potty. Descanso Beach Ocean Sports rents ocean kayaks that you can use to paddle to your camping site. They also have a good list of practical tips.